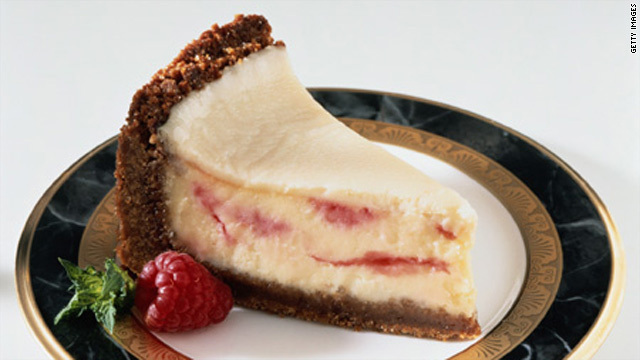 Cheesecake and other fatty foods overload the pleasure centers in the brain. (Health.com) -- Scientists have finally confirmed what the rest of us have suspected for years: Bacon, cheesecake, and other delicious yet fattening foods may be addictive. A new study in rats suggests that high-fat, high-calorie foods affect the brain in much the same way as cocaine and heroin. When rats consume these foods in great enough quantities, it leads to compulsive eating habits that resemble drug addiction, the study found. Doing drugs such as cocaine and eating too much junk food both gradually overload the so-called pleasure centers in the brain, according to Paul J. Kenny, Ph.D., an associate professor of molecular therapeutics at the Scripps Research Institute, in Jupiter, Florida. Eventually the pleasure centers "crash," and achieving the same pleasure--or even just feeling normal--requires increasing amounts of the drug or food, says Kenny, the lead author of the study. "People know intuitively that there's more to [overeating] than just willpower," he says. "There's a system in the brain that's been turned on or over-activated, and that's driving [overeating] at some subconscious level." In the study, published in the journal Nature Neuroscience, Kenny and his co-author studied three groups of lab rats for 40 days. One of the groups was fed regular rat food. A second was fed bacon, sausage, cheesecake, frosting, and other fattening, high-calorie foods--but only for one hour each day. The third group was allowed to pig out on the unhealthy foods for up to 23 hours a day. Not surprisingly, the rats that gorged themselves on the human food quickly became obese. But their brains also changed. By monitoring implanted brain electrodes, the researchers found that the rats in the third group gradually developed a tolerance to the pleasure the food gave them and had to eat more to experience a high. They began to eat compulsively, to the point where they continued to do so in the face of pain. When the researchers applied an electric shock to the rats' feet in the presence of the food, the rats in the first two groups were frightened away from eating. But the obese rats were not. "Their attention was solely focused on consuming food," says Kenny. In previous studies, rats have exhibited similar brain changes when given unlimited access to cocaine or heroin. And rats have similarly ignored punishment to continue consuming cocaine, the researchers note. The fact that junk food could provoke this response isn't entirely surprising, says Dr.Gene-Jack Wang, M.D., the chair of the medical department at the U.S. Department of Energy's Brookhaven National Laboratory, in Upton, New York. "We make our food very similar to cocaine now," he says. Coca leaves have been used since ancient times, he points out, but people learned to purify or alter cocaine to deliver it more efficiently to their brains (by injecting or smoking it, for instance). This made the drug more addictive. According to Wang, food has evolved in a similar way. "We purify our food," he says. "Our ancestors ate whole grains, but we're eating white bread. American Indians ate corn; we eat corn syrup." Health.com: 10 'Last Supper' paintings: Bigger portions over time? The ingredients in purified modern food cause people to "eat unconsciously and unnecessarily," and will also prompt an animal to "eat like a drug abuser [uses drugs]," says Wang. The neurotransmitter dopamine appears to be responsible for the behavior of the overeating rats, according to the study. Dopamine is involved in the brain's pleasure (or reward) centers, and it also plays a role in reinforcing behavior. "It tells the brain something has happened and you should learn from what just happened," says Kenny. Overeating caused the levels of a certain dopamine receptor in the brains of the obese rats to drop, the study found. In humans, low levels of the same receptors have been associated with drug addiction and obesity, and may be genetic, Kenny says. However, that doesn't mean that everyone born with lower dopamine receptor levels is destined to become an addict or to overeat. As Wang points out, environmental factors, and not just genes, are involved in both behaviors. Wang also cautions that applying the results of animal studies to humans can be tricky. For instance, he says, in studies of weight-loss drugs, rats have lost as much as 30 percent of their weight, but humans on the same drug have lost less than 5 percent of their weight. "You can't mimic completely human behavior, but [animal studies] can give you a clue about what can happen in humans," Wang says. Although he acknowledges that his research may not directly translate to humans, Kenny says the findings shed light on the brain mechanisms that drive overeating and could even lead to new treatments for obesity. "If we could develop therapeutics for drug addiction, those same drugs may be good for obesity as well," he says.